Hey! So since part of my 30 Before 30 is to review about 200 books in my Book Journal (post about this coming soon) I thought I would throw a couple thoughts up on the blog too. I read four books this month, and this is what I thought of them.. I liked it! It had a lot of things in common with the show that it's based on, 'Castle'- some scenes were taken straight off of the screen and put on the page but it was nice, as a fan of the show, to be able to recognise certain parts. It was your typical detective novel but with a twist of the reporter Rook getting under everyone's feet and trying to help out. It was basically the show in book form. The writing was good and I was not expecting who turned out to be the murderer! And even though it wasn't as gripping as the other books I read this month, I definitely want to read the next one; Naked Heat. I'm dying to know who the writer is though as, obviously, Richard Castle is a fictional character. They said it was someone on the show but many authors have appeared in the 6 seasons so far- I hope they reveal it by the time the show ends! Genius. Pure genius. I love these books. I wish I had written them. I hauled them on my old blog literally two years ago, read a couple pages on Christmas day and forgot about them. What an idiot. After watching the first movie on Netflix I dug these books out and devoured all three of them in under a week. I love a good strong female lead character which is annoyingly rare and I thought that having both the brutal games and the romance aspect was awesome. It doesn't have to be one or the other and this book is proof of that in a nutshell. Urg. I just want to re-read them knowing what I know now but I'm going to hold off- still a lot more to read on my shelves! The second in the trilogy took me a little longer to get into. I started reading straight after I finished the first and found it a little slow at the beginning after the action of the first. But it came into its own and introduced new characters to love/hate/whatever. The more political side of the story was developed from the first book and had me pulling a face at the injustice. I didn't watch the movie till I finished the book on this one and was pleased that I waited, the books have a heck of a lot more detail. Oh it hurts! I'm a broken record by this point but these books are really good and the ending had me clutching the book and texting my friend in agony. But the good kind of agony that only really great fiction can do. I was actually a fan of the ending unlike the ending of Harry Potter- which I'm allowed to say because even JKR isn't happy with the ending of Harry Potter- and the development from a girl surrendering herself to almost certain death to where this book ended up was serious literary genius. You can friend me on Goodreads here if you want to see what I'm reading as I read it! What did you read in January? Have you ever read any of these books? 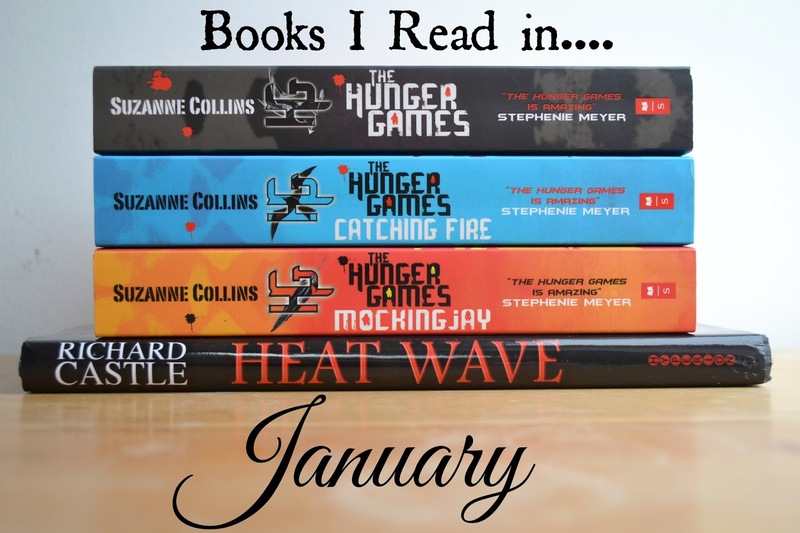 The Hunger Games Trilogy were my books of 2013. I couldn't put them down, and then when I finished them I found myself pining for Katniss!